This lakshana grantha spans 700 pages divided into 12 chapters. He was born on September 29, 1875 in Vadakkancheri-Thrissur district, Kerala. First and foremost he was a teacher extraordinaire. 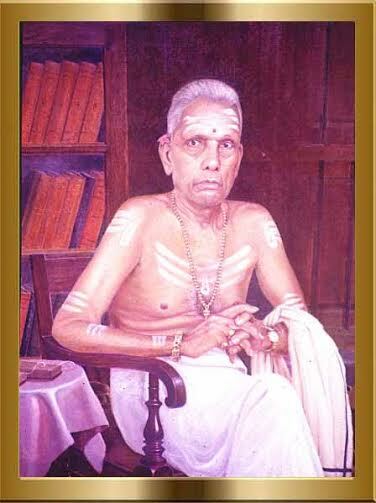 He was the Sanskrit tutor to the Maharaja of Travancore. Jayakrishnan visited my place along with his parents. His mother is Sri. Attur Krishna Pisharody’s grand daughter. The excitement reached its pinnacle, when Mr. Jayakrishnan showed me the Lakshana Grantha “Sangeetha Chandrika”. I felt immensely blessed to touch the great treatise of music and offer my namaksarams to the lakshana grantha. Though the grantha conssits of 12 chapters such as nada, sruthi, swaram, veena etc , the 12th chapter Gitam was a repository of 443 gitams based on the theme RAMAYANAM.!! The gitams were composed in several rare ragas too ! The opening pages of the grantha had a rare photograph of Maharaja Swathi Tirunal minus the Kingly ornaments..It also had the painting of Sri. Attur Krishna Pisharody. Posting it below. Sri. Jayakrishnan has sent me a biography of Sri. Attur Krishna Pisharody to be shared with the friends, visitors and musically passionate minds who visit this blog. Please click the link below to read the biography of the great musicologist !! Just read your webpage. Could you give me the contact no or mail of the grandson or grand daughter of Sh. Atoor krishna Pisharoti. I am now 87 yrs and was very close to mr and Mrs Pisharoti. My Phd was a study of Krishna Chandrika of Atoor. You are blessed!!!! Are there any krithis of trinity in that book? When was that book written? I did not have time to give such a deeper look into the book. The book has 12 chapters beginning with Nada, Sruthi,Swara, Vina, Gramamurchchana, mela,tala,varnaalankara,gamakasthayi, prabhanda, raga and gita. The last chapter gita has 443 gitams whose theme is Ramayana.. INCLINED TO POSSESS A COPY OF THE BOOK AMONG THE MANY IN MY LIBRARY. PL GUIDE ME HOW TO. I am eagerly waiting for the book (to learn more) that will be published by his grandson..
Rubinz, this is exactly I am searching for. Someone to tell give a brief about Krishnachandra melas of 84 in total. You have almost answered it by dvimadhyama panchama varja melas, in which the second ma is sung as pa. I would like to read your write up on that. Please guide. Rubinz are you on facebook or blog please give a lead. I am glad to note your comment about Attur gurupadar’s work. My apologies that I did not see this comment earlier. In Sangita Chandrika, a total of 84 melas are presented. These include melam’s with both madhyama but I do not recall seeing them under the name ‘dvimadhyama panchama varja’. The categorization of melams is primarily the shudda melams (32) and sankirna melams (52) and it is in the latter where there are 12 melams that have both madhyama. There are precise rules and conventions described in the treatise and it would not be possible to list them all here. Melas formed through sankirna svaras fall in sankirna melas. These melas (ie with both madhyama) have limited ranjakata gunama and have limited ability to color (ranjakata pratibandham). The katapayadi system used to layout the melams is simple and straightforward. All swaras excluding sadja and pancama are either shuddha or vikrta. In the example you gave for shankarabharanam, it falls under ragottamsam melam. The naming is as follows: ra-go-ttam-sam. In Katapayadi the syllables, ra denotes 2, ga 3, ta 6 and sa 7; which means that this mela has the 2nd, 3rd, 6th, 7th svara’s that are vikrta. The 2nd svara is rishabha, 3rd is gandhara, 6th is dhaivata and 7th being nishada. For comparison purpose, The next mela is named raviteertha with dharmavati as the marker sampoorna ragam. raviteertha is ra-vi-teer-tha. The only difference with the preceding mela is the placement of syllable ‘va’ which denotes 4 in katapayadi. The fourth svara is madhayama. Raviteertha and ragottamsam differ only in gandhara and madhyama. Anuradha deserves credit for hosting this informative forum. If you could share your contact with Anuradha, I can obtain your information. Thanks for this information. Shall check. Mr Jayakrishnan could I have your contact details please?